Can this be made in a regular oven? My micro is broke. Also, how would using coconut flour instead of almond flour change it? Lovinsherry7 Is this supposed to be 1/2 tsp baking powder? I tried with baking soda and it was overpowering. I could not eat it at all. I have added a packet of Lankato Monkfruit to make it kind of like an Hawaian roll. Or add 1/4tsp garlic powder and 1/4c shredded cheddar to make garlic cheddar biscuits. Also, I have added 1Tbs Hershey's Dark Cacao and 1Tbs of the Monkfruit to make a chocolate muffin. While it is cooking for the 90 seconds, mix 1 oz cream cheese with 1tsp each monkfruit and cacao and thinned a little with heavy cream to make a frosting. When muffin comes out, split in half horizontally and frost each half with the cream cheese mixture. I know I must be doing something wrong, but darned if I know what. Mine keeps coming out like a spongey omelette, tastes good, but I can't stand the texture. Any suggestions???? You're never too old to dream new dreams --- and have them come true. Oooh, is that the 90 second bread recipe? I keep meaning to try that. You're one step closer to being a MERMAID! love this recipe! 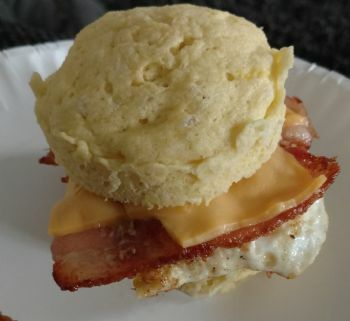 finding myself having this bacon, egg and cheese biscuit for breakfast almost every time, lol. yum! and so easy! i dontt do it unless it's easy! melt butter in mug. mix other ingredients in and microwave for 1 minute. that's it! let cool and tip upside down onto plate. cut in half and make a sandwich. This is the only one I’ve tried thus far. It was very good. I made it in a ramekin rather than a mug. I liked the flared out shape with the glaze. One was enough for two people. 12/2018: Began EFs 2-3 42 hr fasts per week. Ditch the Carbs has a whole section on mug cakes...good luck! Playing around with a few recipes so I'm not ready to post a fav just yet. I know banana isn't keto but found a great recipe for my kiddos. Before Keto I made regular banana muffins at least once a week so I had to find a new recipe. It was a hit with them and that's all that matters for now, lol. Also tried a chocolate chip mug cake which me and my kids really liked but I think it needs to be tweaked to bring the carbs down yet a bit more.